This house is situated in the southern part of Insula V 1, opening up with its main entrance towards the Via di Nola. It is named after a small fountain statuette found on a base on the rim of the impluvium in the atrium. Another name sometime used is the House of P. Pontius Successus after a seal stamp found near the main entrance. It forms a quite large atrium house, for certain span of time even a double atrium house together with V 1,3. It was excavated in two portions, the southern part in the 1836 - 38 and the northern part probably 1876. Unfortunately no reports, neither in the handwritten giornali degli scavi nor in the published works are known from the excavation in the northern part. Probably the inconsistent naming of the rooms, with numbers in the south and characters for most rooms in the north is due to the different moments of excavation. The house was probably built in the third quarter of the second century b.C. as indicated by the use of tufa stone for the magnificent facade as well as by stylistically analysis of the figured capital originally placed on the eastern pillar of the entrance (v. Märcklin 1962). Probably also the remains of first style decorations preserved in some rooms, mainly in room 8, belongs to that earliest stage in the history of the building. Judging by the uniform formation of the original facade, of which the western part later was repaired in tiles, the entire southern part of the Insula was constructed at the same time and probably owned by one person. This single ownership of the entire southern part of the Insula is at least from the early imperial time onwards confirmed by many interrelations between the different entities, such as the overlapping upper storeys and water and waste water arrangements. The atrium area best preserves the original lay out of the house. It presents the more or less typical structure with the tuscan atrium in the centre flanked on both sides with symmetrical arranged cubicula (7, 8, 15, 16), alae (9, 14) and on the front side the tablinum (13). Later on the house underwent several restructurings, expansions and also diminutions, to a smaller degree in the front part and to larger extents in the rear part to the west and east of the peristyle. 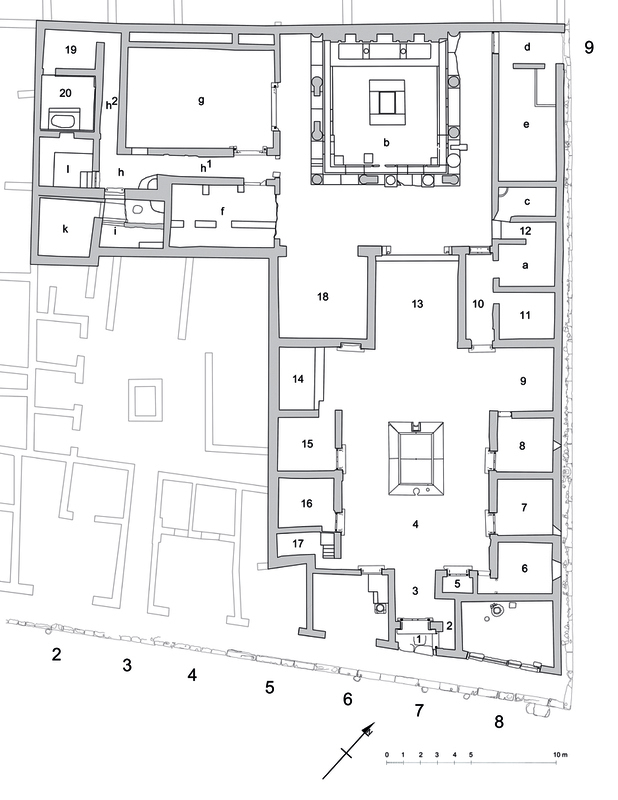 A first rebuilding phase took place in late republican times, concerning some smaller, but important changes in the area of the atrium ( see rooms 2,3, 4, 6, 7, 14) and a first expansion towards the west in the rear part of the house (see rooms b, f, g). This rebuilding phase was probably accompanied by a redecoration phase with wall paintings - now nearly totally lost - belonging to the mature second style (rooms 4, 7, 9, 13, 14, 18) (Beyen 1960). Probably also the paving of the entrance (rooms 2 and 3), atrium (room 4), alae (rooms 9 and 14), tablinum (room 13) and room 18 belongs to this phase. A second important expansion and rebuilding phase took place probably in Tiberian or Claudian times, concerning once again mostly the rear part of the house. Here the bathing area (rooms h², 19, 20) in the north-western part of the now enlarged house was added as well as some rooms in a domestic work area nearby (rooms h, h’, i, k, l) and the large cenaculum g. Judging by the plaster analysis it seems probable, that also the annexation of the adjacent, originally independent house, V 1,3 took place at that time (see room 15), so that it now formed a double atrium house. In the front part of the house the cubicula (rooms 7, 8, 15, 16) around the atrium were redecorated with wall paintings of the late Third style, in the rear part also the baths had decorations from this period. A further important element added to the house in the time of the early empire was running water from the aqueduct, which was extensively used, mainly to decorate the atrium 4 and the peristyle b, where the large facade-nymphaeum decorated the north wall. Also the viewing axes from different rooms towards the peristyle where adorned by water plays. (Anderson 1991 and Staub 2008). The much differentiated water distribution system of this house, probably the most complex one known to us from Pompeii has been studied and traced during several field campaigns. Five different distribution boxes in different rooms (kitchen l, peristyle b, atrium 4 and the atrium 2 of V 1,3) ensured that the water was distributed and could be controlled for the different areas of the house and individual or groups of water outlets. Three parts of the house can be determined as areas for domestic work, storage or servants quarters. These are room 6 in the south-eastern part, rooms 11, a, 12, c and e on the east side of the peristyle and h, i, k and l in the north-western part. The private bath suite (rooms 19 and 20) are closely related to the kitchen l, both by means of topography and the heating and water distribution. This house was excavated in several stages. 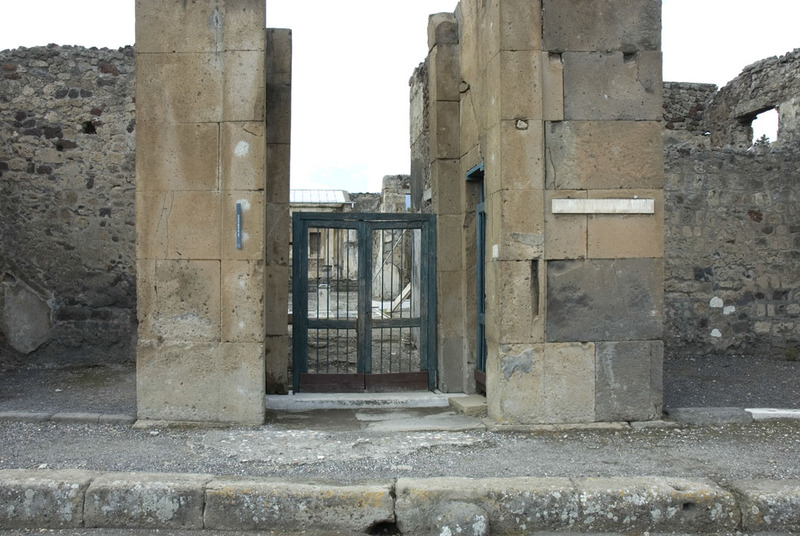 The first works affecting it were part of the absolute first excavations carried out in Pompeii during April 1748 in the south-western corner of the insula (Fiorelli 1875, p.419), as later described in the first volume of the PAH. In our house this work concerned the rear, western part, probably comprising rooms 19, 20, h, i, k, I, f, g, at least in parts (see plans by La Vega 1810 and Giosuò Russo 1817). These rooms were soon thereafter reburied. The front part of the house was excavated between 1836 and 1838 and the rear part, including the reburied parts, probably sometimes between 1876 and 1878 together with the central and northern part of the insula. Maybe the lack of documentations from the excavations in the 1870’ies is due to the fact, that it at least partly was considered a re-excavation and not a new one. Cleaning work conducted by the Swedish Pompeii Project 2006 (peristyle b) and 2009 (kitchen l) revealed fascinating elements belonging to the complex water distribution system of the house. Some sondages made in the large dining room g in 2008 revealed remains of an earlier lay-out of this area belonging to a first extension of the house towards the west (see room g), consisting of three smaller rooms, which later were torn down to create the large dining room.